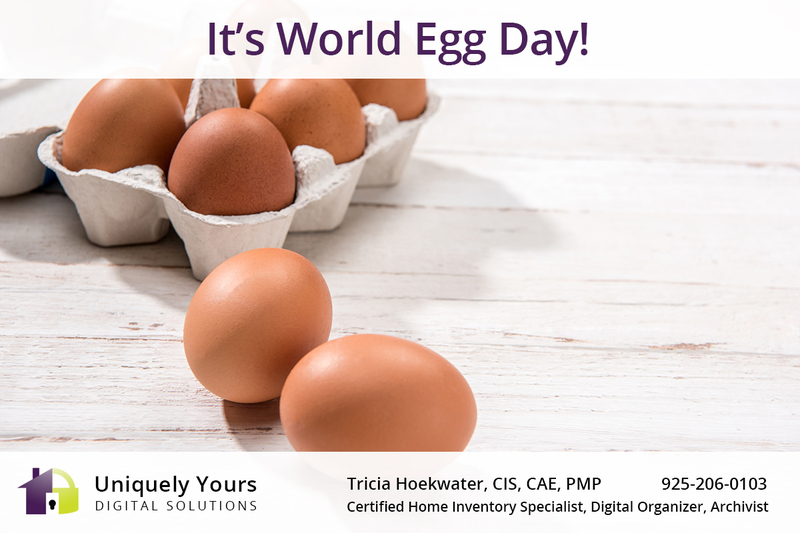 WORLD EGG DAY: Eggs are a very good source of inexpensive, high quality protein. More than half the protein of an egg is found in the egg white along with vitamin B2 and lower amounts of fat and cholesterol than the yolk. The whites are rich sources of selenium, vitamin D, B6, B12 and minerals such as zinc, iron and copper. Egg yolks contain more calories and fat. They are the source of cholesterol, fat soluble vitamins A, D, E and K and lecithin – the compound that enables emulsification in recipes such as hollandaise or mayonnaise. Take care of yourself…your family…and what you have! Get a home inventory today. Contact Tricia via phone at 925-206-0103 or by email uniquelyyours@outlook.com to schedule your inventory today.